Take a trip into the woods and find yourself at this luxurious retreat. Complete with bells and whistles, Big Creek Cabin offers the comfort and glamour that you may be looking for in a vacation. Walking into this forest home, you won’t be able to help but notice all the fine touched and amenities offered to you. The kitchen is fully equipped with everything you would need to prepare a feast fit for royalty. And you’ll feel like royalty preparing it with stainless appliances and granite countertops. Enjoying your masterpiece with friends and family has never been easier than at the adjacent dining area. The great thing about this dining room is that you can feed your eyes with mountain views while you feed your belly with a home-cooked meal! When rest and relaxation is on the menu, curl up to the gas fireplace in the living room…Perfect atmosphere for diving into a good book. Adventure time is convenient with so many outdoor amenities! Play a game of foosball on the lower deck while you listen to the birds chirp, or soak your bones in the hot tub located on its own screened in porch! 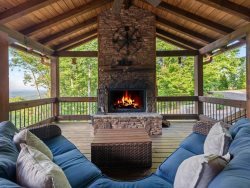 Another screened in porch waits for you with a wood burning fireplace, perfect for making s’mores and roasting hotdogs almost all times of the year. Weather not cooperating? That’s OK! The lower level offers a recreation room with a large Flat Screen TV so that you can have a movie-night-in! When bed time rolls around, there’s no doubt that everyone will be pleased with their snoozing quarters. The upper level offers a King Bedroom with an En Suite Bathroom, 50” Flat Panel TV and a private deck. On the entry level you’ll find a conveniently located Queen Bedroom with a 42” Flat Panel TV and attached bathroom offering a stone tile shower. If lower level living is more your style, come discover the Bunk Room with two sets of bunks including a total of 3 twin size beds and 1 full size bed. This level also offers a bathroom with a tub/shower combo. Accommodations are a breeze at Big Creek Cabin, it’s your turn to plan the vacation. Located in the Aska Adventure Area, about 20-25 minutes from downtown Blue Ridge shopping and dining. Super friendly, responsive when needed and the cabin was superb. Beautiful, well maintained, and well stocked. See the FAQ Page for additional questions.